The table rows represent the current state of the player and the columns the next state of the player. The cell at the intersection of a given row and column lists the events which can cause a transition from the row state to the column state. An empty cell represents an impossible transition. The transitions to UNKNOWN and to and from HALTED status are intentionally not tabulated. UNKNOWN is the initial status of the player before the media source is pre-rolled and cannot be entered once exited. HALTED is a terminal status entered when an error occurs and may be transitioned into from any other status but not exited. Reaching the end of the media (or the stopTime if this is defined) while playing does not cause the status to change from PLAYING. Therefore, for example, if the media is played to its end and then a manual seek to an earlier time within the media is performed, playing will continue from the new media time. State of the player immediately after creation. While in this state, property values are not reliable and should not be considered. Additionally, commands sent to the player while in this state will be buffered until the media is fully loaded and ready to play. 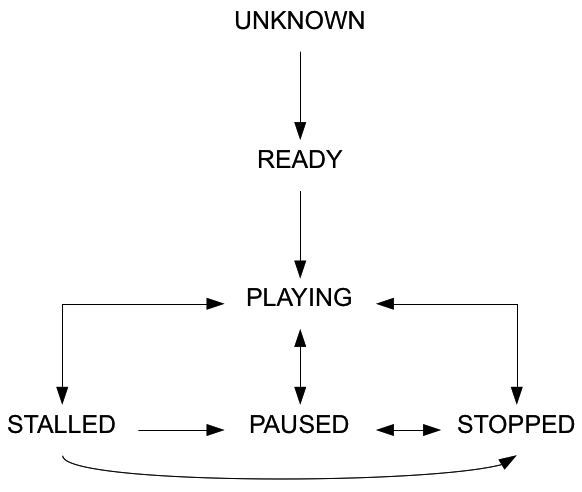 State of the player once it is prepared to play. This state is entered only once when the movie is loaded and pre-rolled. State of the player when playback is paused. Requesting the player to play again will cause it to continue where it left off. State of the player when playback has stopped. Requesting the player to play again will cause it to start playback from the beginning. State of the player when data coming into the buffer has slowed or stopped and the playback buffer does not have enough data to continue playing. Playback will continue automatically when enough data are buffered to resume playback. If paused or stopped in this state, then buffering will continue but playback will not resume automatically when sufficient data are buffered. State of the player when a critical error has occurred. This state indicates playback can never continue again with this player. The player is no longer functional and a new player should be created. State of the player after dispose() method is invoked. This state indicates player is disposed, all resources are free and player SHOULD NOT be used again. Media and MediaView objects associated with disposed player can be reused.